LAST THANKFUL DAY! 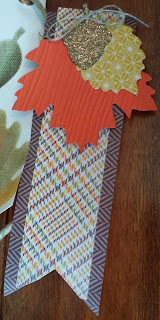 If you missed the first 9 projects, click here: 5 Thankful Days Project #1. I have posted two projects a day for 5 days so I hope you have enjoyed them! My fabulous upline Becky Liggin originally designed this banner which I made a tiny bit differently, but it is so beautiful, isn't it??? Bet you are wondering how I got those leaves on there. 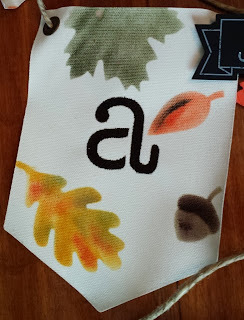 Becky had the fabulous idea to run a piece of acetate (overhead projector film, I think) through the BigShot to create a stencil, then I sponged colors onto the banner. Here is the simply created banner kit used to make this precious banner. Use letter stencils to stencil "thankful" on banners in early espresso ink. Squirt a little ink onto plastic lid or whatever you can find :). 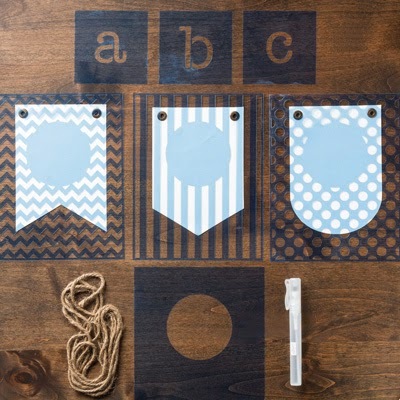 (TIP: do not tap or dab, but use a little bit of ink at first and drag and rub the ink onto the banner. I had way more luck with this technique than using the sprayers). Remember, you can always add, but you can not take away. 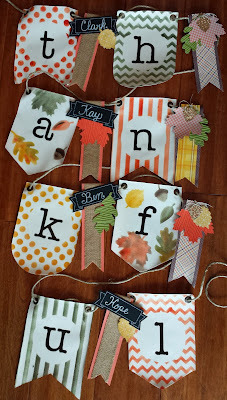 Sponge chevron, polka dot, strips and leaves on banners in same back and forth motion. Let dry. 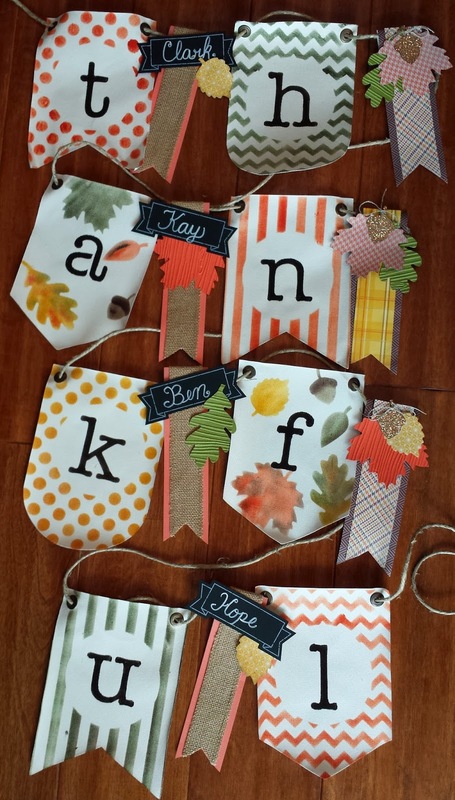 Cut leaves out with autumn accents bigz die. 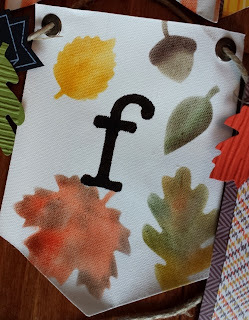 Cut acorns with champagne glimmer paper and autumn accents bigz die. Sponge edges of acorns with chocolate chip ink. Write names on black chalkboard pieces with white chalk marker. Cut strips of sweater weather and layer onto strips a little bit wider for pieces in between pennants, cut "v" in strips. 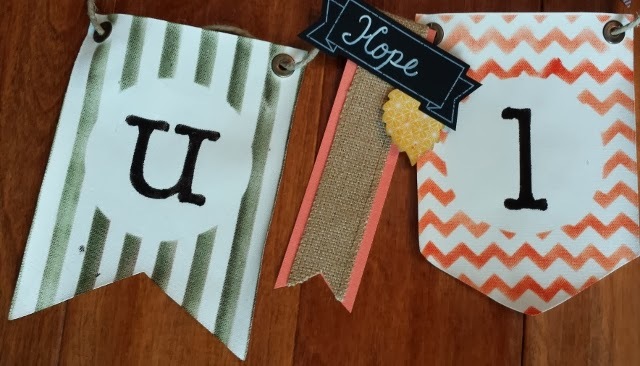 For the strips between the banner pieces, make the strips a little longer and fold them over themselves on the back and tape leaving room for the jute to thread through. Tie linen thread around acorns. Layer leaves, acorns and black chalkboard pieces with glue dots. Thread jute twine through the pennants, starting from the front and going through the back on each pennant/paper strips. Thanks for visiting my 5 Thankful Days. Watch for a Christmas series in the future. Subscribe to my blog so you won't miss a thing! www.papermadeprettier.com.